The Australian-led air search for Malaysia Airlines flight MH370 was called off this evening without anything being found. The search teams are scouring the remote waters of the southern Indian Ocean to see if they can spot the two objects picked up on satellite that may be debris from the plane that disappeared en route from Kuala Lumpur to Beijing nearly two weeks ago. One of the objects is said to be 24 metres long. 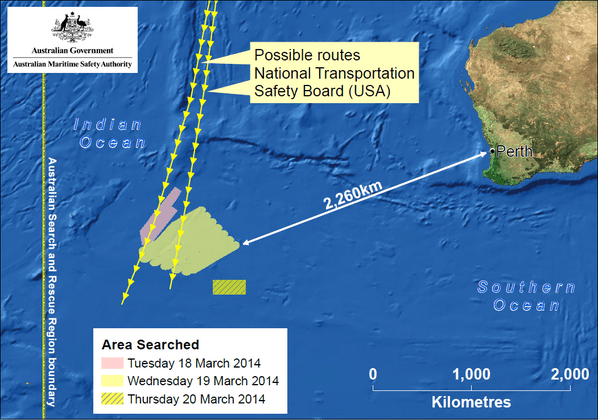 The search area is about 2,500 kilometres southwest of Perth on Australia’s west coast. Given the distance to and from this area, the aircraft involved have an endurance of approximately two hours of search time. The five reconnaissance aircraft deployed in the area today included three Royal Australian Air Force P-3 Orions and an ultra long-range Bombardier Global Express. The Australians replanned their operation, sending aircraft flying low so teams could visually search for objects rather than using radar. Aircraft operating in poor visibility conducted a radar search yesterday and found nothing that could have been from the missing plane. Today the weather forecast was better. There was low cloud, but it was relatively clear underneath that cloud. 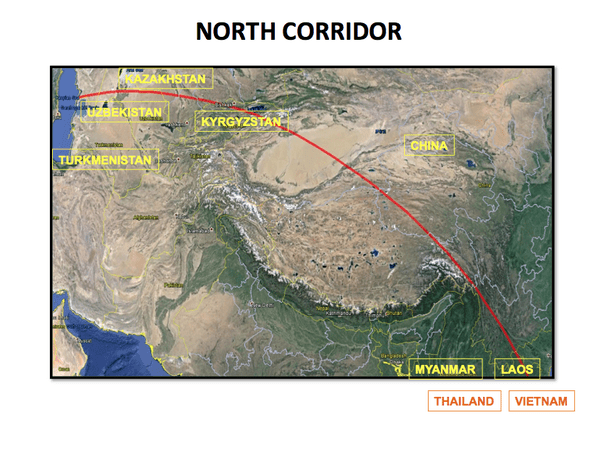 Search operations are continuing in the northern search corridor, which stretches from Thailand to central Asia and Malaysia is waiting for Kazakhstan to give permission for its territory to be used as a staging point. The Malaysians insist that, until the missing plane is found, both the northern and southern search corridors are equally important. The satellite images of the two objects in the southern Indian Ocean is, however, considered to be a credible sighting and has sparked a massive international operation using the world’s most sophisticated resources. Malaysia’s acting transport minister, Hishammudin Hussein, said today that if such teams using this kind of equipment couldn’t find MH370, he didn’t know who could. 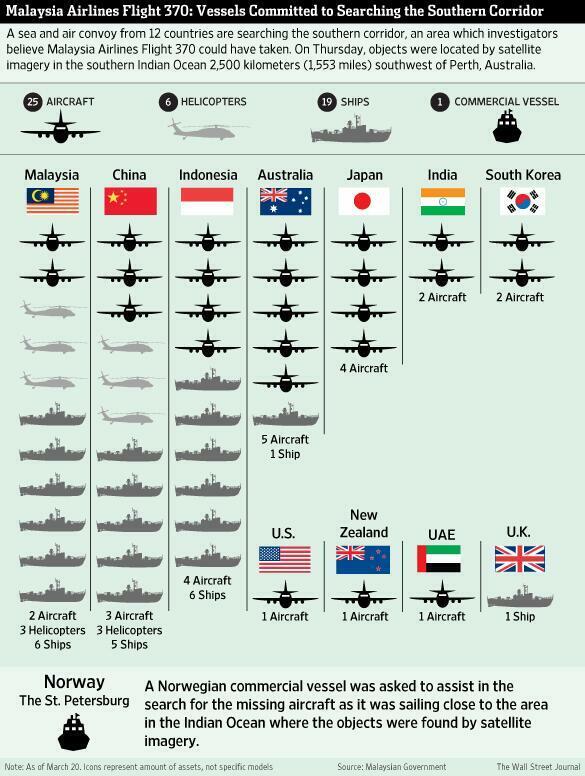 China has deployed five ships, three aircraft, and three ship-borne helicopters. Japan has also sent resources that include two P-3 Orions. The US is deploying a P-8 Poseidon. The Australian naval vessel, HMS Success, will be reaching the search area tomorrow and Britain’s HMS Echo is also on its way. A Norwegian cargo vessel was called in to assist and is already there. Malaysia’s acting transport minister, Hishammudin Hussein, said he wanted to be careful not to alarm relatives of those on board the missing plane, but he is already talking about needing sonar equipment if the plane did go down in the southern Indian Ocean. Very few countries have this kind of equipment. Mr Hishammudin was due to talk to the United States’ defence secretary, Chuck Hagel, this evening to see if the US would make remotely operated vehicles available for ocean salvage. Malaysia is getting help from a French delegation, which includes the man who led the search in the Atlantic for the Air France plane that crashed in 2009. It took two years to find that plane’s black box. If MH370 is not found within the next two weeks, the usual 30-day transmitting period for the black box will have passed. The search would then enter a different realm, Mr Hishammudin said. He spoke again of the urgent need to narrow the search area. Mr Hishammudin said there were briefings yesterday for relatives of those on board flight MH370 and the discussions were “constructive and frank”. The meeting brought the families and the Malaysian authorities closer together, he said, “not just in terms of sharing information, but also in terms of listening to the voice of the family members”. A high-level delegation from Malaysia has, meanwhile, gone to Beijing to talk to family members. The Malaysians are clearly trying to repair the damage caused when desperate Chinese relatives came to the airport hotel on Wednesday to protest and talk to journalists and were dragged away by police. Mr Hishammudin said today that background passenger information has now come back from Ukraine and shows nothing suspicious. Only Russia has yet to provide background check information about its nationals who were on board the missing plane. The Malaysian authorities say data from the flight simulator taken from the home of the chief pilot, captain, Zaharie Ahmad Shah, is still being analysed. They say results of that investigation will be released soon. There have been press reports about a Malaysian woman from Kota Tinggi in Johor who says she saw bits of a plane in the waters in the Indian Ocean when she was on a flight from Jeddah to Kuala Lumpur on the morning that flight MH370 disappeared. Raja Dalelah Raja Latife lodged two police reports, but no-one followed up on her sighting. She is convinced that the objects she saw were from MH370. Some have poured scorn on her claims, saying she couldn’t have seen debris from a cruising altitude, but others say she could be right. It is now known that the flight turned around from its charted course to Beijing, so the sighting could make sense.